Brake drum size on 1983 Dodge D150? 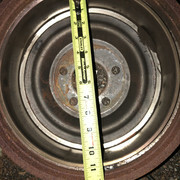 Post subject: Brake drum size on 1983 Dodge D150? I’m working on a cart for summit racing and I’m seeing that there are multiple sizes of drums listed for my truck, some 10”, some 11”, and some 12” and it seems that way at every parts store. 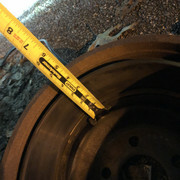 I measured the backing plate with the wheel on and it measured in at approx 12” in full diameter but I haven’t pulled the weeks off to check the drum size officially, but I thought if anyone knew, that would be great! I’ve seen most info online leads me to believe they are 11” drums. Would anyone have any idea? 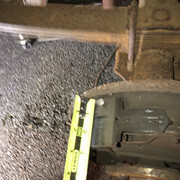 Post subject: Re: Brake drum size on 1983 Dodge D150? I'd just pull the wheel to be sure. that is what my 83 D150 has, and actually they were not too bad to work with. A arms are attached to the truck. what shows as the 'optional' brake components in the auto store parts catalogue. look at the other side of the truck. I took one of the rear drums off tonight to peek at what size I’d need and the internal diameter of the drum is 11” so that answers that question. Now just to figure out what wheel cylinders to buy and all the matching parts. Should be a weekend job. I’m pretty sure nothing has been done to the truck over the years and a lot of parts are still original and worn out. Just trying to get everything in decent working order. I may order pst front end rebuild kit since it has all the “polygraphite bushings”. Can you actually feel wear and slop or are you just replacing due to age? Might just need to be cleaned, greased, and adjusted. Depends more on the usage and maintenance the truck has had. I have a '76 and a '78 Dodge truck still running the original components with no issues. the '76 does just fine with the original drive train, the 78 is getting a big block just for fun. They get driven regularly. Oh yeah, it’s all original components and all the bushings are dry rotted for sure. I’m going to do a full suspension and brake overhaul. Interesting that your D150 has the 11 in. drums. My '82 has 10 x2.5 in. drums. I wonder if that was an option on the 2wd slant trucks? I'd guess that the V8 D150's got the 11 x 2 in. standard and the D250 got the 12 x 3. I haven’t installed them yet but when I pulled off one of the old ones, they had an 11” inner diameter in the drum. I guess it’s possible that the drums could have been swapped at the point or it was an option when the truck was ordered. But here’s what I measured when I popped one of the old ones off. I'm sure that your 11 in. drums were original. My '82 is about bare bones. Essentially a Miser with a 30 gal. tank and power steering. It's hard to believe that they wouldn't use the common 11 in. rear brakes on any pickup as a minimum. They were widely used for a long time on all sorts of Chrysler vehicles. Good luck with the truck refreshing.